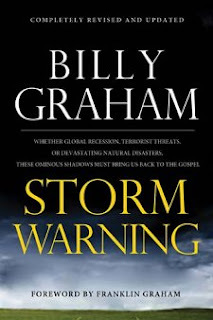 A sigh of relief, I finally finished Storm Warning by Billy Graham. Unfortunately, I feel disappointed, my high expectations were not met. Eagerly hoping to get a better grasp of End Times theology, the first four chapters found myself stuck in a redundant cycle of something along the lines of "bad news in the headlines, the book of Revelation said this would happen..." Over and over again. It is true that new headlines show us a world rejecting God more and more, and we're harvesting the consequences of false religion, faux spirituality, wars, famine, and sickness, but the beginning of the book just went on too long. I was ready to give up. The middle chapters begin to show us what it could have been like for the apostle John to receive this visit and vision from our Lord Jesus. Interesting, but doesn't really help me much. Finally, something I can use: By Chapter 8, Graham finally begins an explanation of the four horsemen and seven seals of Revelation. If you are already a follower of Jesus with a good grasp of the news of the day and the marketplace of ideas, skip the first 7 chapters and begin reading chapter 8. You may even want to begin in Chapter 10. It is here where Graham begins to match today's spiritual deceptions, self-centeredness, wars and rumors of wars, famine, and death, to what John wrote about in Revelation. Graham continues by discussing Revelation's promises of perseverance of the saints, Christ's return, the New Heaven and New Earth, and our co-reigning with Christ. Here, he does a good job. Chapters 10 through 16 finally brought me to where I wanted to be, a firmer understanding of how what's happening today could be explained by the Book of Revelation and other end times Bible passages. Graham believes that Christ will return after what's happening now continues to grow worse and decay into the full blown tribulation. In other words, Graham believes Christ's return will be after a season of great tribulation. We may be well into that tribulation now. He explains his conclusions well. In summary, it is worth the read, if you can get through the first parts. Newer believers and those still debating the claims of Christ will benefit most from the beginning and middle of the book, veteran Christians will struggle. We all benefit from Graham's decades of study. In the end, Graham does what he does best, calling lost sinners to repent and follow Jesus, and us Christians to follow Jesus at a deeper level. Hmm, haven't heard of this book. Love studying theology, but eschatology is definitely a blindspot for me. Still, I've had plenty of end times discussions with my friends, and I think it is worth noting (as you are no doubt aware) that the church has thought "We are in the end times!" for the greater part of its existence. I don't cry foul, but I guess I just wonder sometimes if the emphasis on eschatology doesn't distract Christians from more important things? Granted if we take it seriously it should put wings to our feet when it comes to spreading the gospel. Be ready at all times, eh? Glad to read your review of Storm. Have you found any other good books on the subject?